I'm very new to Model T's so I could use some wisdom before I risk frying my engine or transmission. 1) I had an exhaust leak, so I took off the old manifold and replaced it, along with the glands/rings/ etc. 3) Since one of my Welch plugs was leaking I replaced it with a nice buffalo nickel. 4) While the plug was out, I flushed water through the cooling system, clearing out all sorts of gross stuff. I was lazy and used the Welch plug hole as the drain since it was already out, and splashed a good amount of water all around. 5) My parking brake rebuild kit arrived so I started that job. I had to leave one brake rod disconnected because I need another part, so only the right side parking brake is connected and functional. 6) I replaced the screen in the sediment bulb-- it was totally packed with crud so I have no idea how I was getting fuel. But I cleaned the bowl and everything was running clear. I started it up, and after surface oils burned off the exhaust manifold I noticed a fair amount of smoke coming out of the cover where the throttle rod goes under the block. This got worse, until suddenly it stalled. When I tried to restart it seemed like it was in gear. Lurched forward against the wheel chocks (good thing those were there!) I took the cover off the transmission-- moderate smoking. Is that normal? The brake lever felt tighter than normal, but I don't have a ton of experience with what it should feel like. I let everything cool, and restarted with parking brake lever in what is usually neutral, but again the car lurched forward badly. I pulled the lever back to park position. Started up no problem. Turned it off, returned lever to neutral position. Started up, no lurch this time. Smoke continues to come out of the hole with the throttle pusher rod. I'm wondering if I splashed water in that hole and this is just water and surface oils burning off? Is the lurching just the car shifting into gear as the transmission warmed? Or could something more serious be at play? I'm afraid to leave it running for more than a couple of minutes now. Any advice on how to proceed? You probably got a lot of water in the crankcase when you flushed it without the welch plug. The valve chamber has drain holes to drain the oil back into the bottom of the engine, so any water that got through the throttle rod hole in the cover is probably in the crankcase now. Better change the oil before you run it again. 1. Takes notes so you can remember what and how you checked things. 2. Did it run and drive fine before you worked on it? If yes -- then I would suggest the following items. A. Loosen the oil drain plug at the bottom of the transmission and see if any water comes out. The water should be at the bottom if it is inside the crankcase. If you find water -- drain and change oil. B. I would remove the right side parking brake rod. I suspect -- but I have no evidence to support that hunch -- that because it is only connected on one side it might be causing the car not to go into neutral as it should. But that is just a guess. See the posting at: to see how to adjust the free neutral. C. You did not say anything about what type of oil you are running in the car. If you have straight 30 weight that can also cause the clutch to drag more than a 10-30 wt oil would do while the car is cold. Once it is warmed up they should both have the same 30 wt consistency. D. When you said you "took the cover off the transmission" please confirm that you only took the inspection cover off (light stamped steel held on with screws) and not the actual cast steel heavy transmission cover. E. Was any work done on the transmission in say the last 300 miles? I'm sure you will get it sorted out and hopefully if it happens to someone else in the future you can refer them to this thread. Thanks guys, checking/ changing the oil seems like an easy first step, as is removing the right brake rod until I can install and adjust both sides. Those parts are due any day now. And yes, I just removed the transmission inspection plate, not the hogshead. I was going to install the shiny new filter under the cover, but decided to wait until this is resolved. I am running 10W40 oil, changed within the past 50 miles. All I did to the transmission recently is tighten the low band by half a turn. It drove fine after that, but I just backed it out to remove one variable. Given how bad the exhaust leak was, it's possible there was smoke coming out of the throttle rod hole before and I never noticed it. Since there are drain holes to the crankcase in there, I'm guessing a head gasket problem could cause a similar symptom? I'll see if there's any water in the oil when I drain it. Should I take off the cover to the valve chamber to look for anything amiss, or is that another can of worms? Another beginner question: is there an easy way to know if the "smoke" is steam or oil burning off some surface it doesn't belong on? Since there is always some oil burning off a surface on this engine I don't know how to isolate this source. Sounds like either the low band or the clutch is causing the lurch. With the transmission inspection plate off, and one or both rear wheels on jack stands, have someone turn the starting crank while you carefully inspect the drums. Look in the area between the ends of the bands for cracks in the drums. Also look at the lining to see if it is shreded. You could have a cracked drum which is causing the low gear to be engaged. The pedals should start to move sideways as you press them down. They should stop and the bands be fully compressed between one inch and one and one half inch above the floorboard. If they stop moving higher than 1 1/2 inch above the floorboard they are too tight. Also see the attached diagram for adjustment for a free neutral. This will give you a free neutral if the transmission parts are in good condition. I have to admit I don't quite understand this diagram. I push my control lever forward until the clutch lever bolt is clear of the cam, then pull the clutch pedal back, but then I'm not sure what "Adjust the yoke to have 1/16" play in direction shown" means. Can someone add a few words about which part is moving relative to which part, in what direction? Sorry for being so dense. I would jack up the rear end and put on jacks, so the wheels are off the ground. That will save you from having to depend on the wheel chocks for the lurching. SOME drag is allowable in neutral, as there really isn't a 'true' neutral gear per-se ... just a spot somehwere in the middle of the brake arm swing that is the 'most' neutral. ;-) It might be a little harder to find that neutral point with the wheels off the ground, though. You could leave the car off, disconnect the brake rod to the working brake (to eliminate that from being a source of your problem), then move the brake notch-by-notch, forward until you find the 'best' neural, and note, or mark it. Start your engine up and see if it still wants to move itself forward. While it's up, you can test reverse is functioning properly, as well. 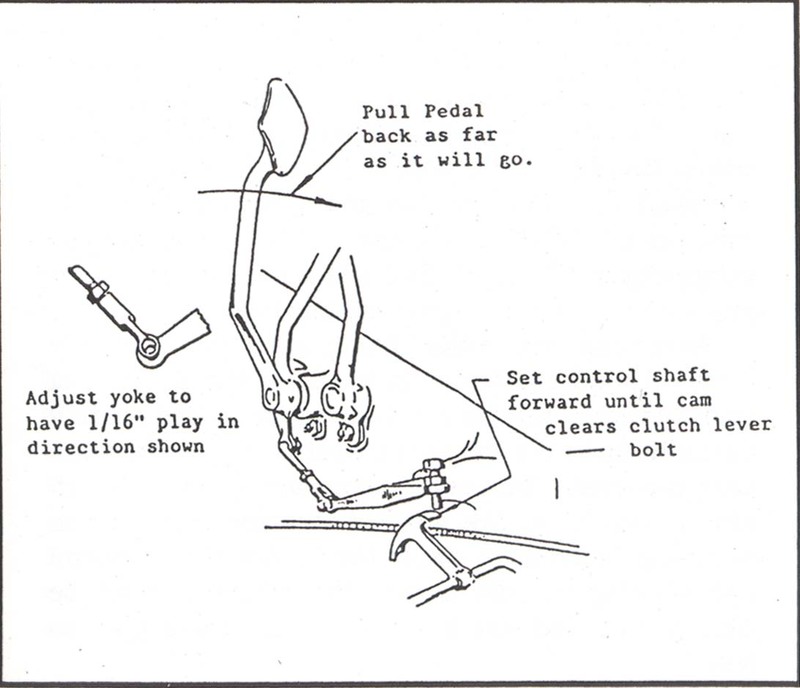 The "yoke" is the rod connecting the low pedal with the clutch lever. The clutch lever is the piece coming out of the hogs head with a bolt which rests on the cam of the cross shaft when the parking lever is in the neutral position. The pedal is all the way back and the parking lever all the way forward when you make this adjustment. The adjustment is made at the opposite end of the clutch lever opposite the end with the bolt. The clevis on the end is 1 1/6 short. Then the pedal is moved slightly forward so that the clevis pin can be installed. It should look like the picture when it is adjusted. Sounds to me that you just 'might' have a clutch issue and have always had a clutch issue! In any case the wheels want to turn...some with some little force that you cans stop the wheel with your hand...some needing your foot as a pony brake on the wheel...and some being pull that stick back and hard and let it heat up! Take advice, jack-stand and chock before going further. So what worked before and not now? You may have had brake drag before and were lucky enough that the brake drag offset the clutch slip-through and the car stood still. Now you have one brake rod...and nothing on the other side for now. The wheel on the free side is actually trying to turn at twice the rpm, but that's another story for another day. On stands, you'll see what it is and until you get that other rod installed, not much to do. My gut guess? You might want to look in the area of the clutch plate spacing and the 3 lever screws. The 'hint' is that as it gets warm it starts to creep worse. All the others 'should' go the opposite way. I would not recommend going nuts on the lever screws...it only takes 1/2 turn to make a huge difference in that area. Do all of the visible stuff first. Just my 2-cents as a thought. Thank you Norman, that penetrated my skull. All adjusted, neutral seems to work as advertised with pedal and lever. Fresh oil and I still have some smoke coming out the throttle rod hole. It's not so much that I would have noticed before I fixed the exhaust manifold, so good chance this isn't a new problem. A mechanic friend (non-T) suggested combustion gasses getting into crankcase from worn rings, etc., and venting through the vent hole in that space. He said some vintage cars have tube to direct those gasses out under the car. I'm sure new rings, valve work, etc. is in my future, but I'm leaning towards ignoring this for now unless someone tells me not to. There is no PCV valve on a T so any blow by from the pistons or valves goes out through that hole or through the oil filler cap. If the car has good power and doesn't burn excessive oil, and does not knock just leave as is until you need to pull down for overhaul. One good way to check for excessive oil burning is to go down a steep hill in low on compression and then look at the exhaust after you accelerate again. If you get a large cloud of blue smoke out the exhaust, you have excessive oil burning. Final report: no more exhaust leak, neutral seems to work properly without creep or lurching, and people more experienced than me looked at the smoke and said it's not too bad. Compression test: 52,52,50,49 so I'm going to focus on something that needs work-- like the brakes. Thanks for the guidance! I'm learning one system at a time.